Beebe Healthcare hosted Dr. Vindell Washington, the National Coordinator for Health Information Technology, on Thursday, January 12. 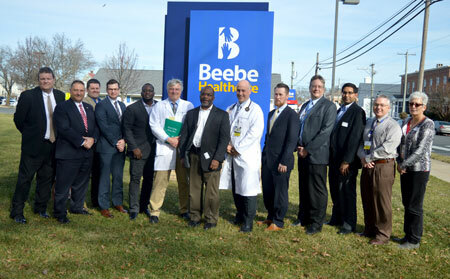 Beebe Healthcare, along with our friends from Nanticoke Health Services in Seaford, demonstrated the pioneering work we have accomplished in the use of CommonWell. CommonWell allows for providers and hospitals to share health data across the country. 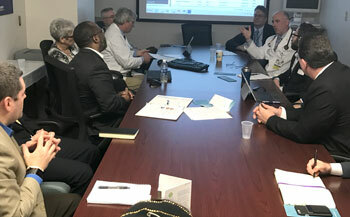 During the visit, Dr. Washington met with members of the executive team and instrumental team members involved with CommonWell. Beebe Healthcare and Nanticoke provided live demonstrations of how CommonWell will revolutionize patient care. In order to make sure CommonWell can work across platforms, the CommonWell team is building partnerships with companies providing electronic medical records, including Cerner and athenahealth. “We are all about the interoperability of CommonWell because it allows us to better support the people in our community,” said Charles Palmer, Chief Information Officer with Nanticoke. The U.S. Census projects that between 2015 and 2020, Sussex County, Del. will see a 20 percent increase in those 65 years and older and a 31 percent increase in those who are aged 75 and older. The demographics, fluidity of residents, and small healthcare organizations creates the perfect opportunity for innovation and CommonWell allows both Beebe and Nanticoke to benefit from a bridge between electronic medical records to allow physicians to better see the whole picture of a patient’s health whether their last hospital stay was in Delaware, in Florida, or anywhere else. The Office of the National Coordinator for Health Information Technology (ONC) is at the forefront of the administration’s health IT efforts and is a resource to the entire health system to support the adoption of health information technology and the promotion of nationwide health information exchange to improve health care. ONC is organizationally located within the Office of the Secretary for the U.S. Department of Health and Human Services (HHS). ONC is the principal federal entity charged with coordination of nationwide efforts to implement and use the most advanced health information technology and the electronic exchange of health information. The position of National Coordinator was created in 2004, through an Executive Order, and legislatively mandated in the Health Information Technology for Economic and Clinical Health Act (HITECH Act) of 2009. - Rachel Swick Mavity is the Communications Specialist for Beebe Healthcare's Marketing & Communications Department.